Frances, Florence, Linda and Lesley collected Mary in Cairnryan and drove to the village of Dailly, turning off the roundabout just north of Girvan where we met the other walkers. We called in at the tea room to let them know that a crowd of Ramblers would be calling in there later. We set off after 10.15am after Douglas had introduced a new potential member, Andy Gibson. A head count came to 20 – apart from those mentioned above, there were, Andrea, Richard, Mary, Audrey, Susan, Margaret, Ken, Jim, Gordon, Carl, Duncan and a man whose name I forgot to ask. Last Saturday, 19 ramblers took part in an 8-mile walk starting and finishing in Dailly, the former mining village in South Ayrshire. The group started its ramble in the village square, and headed towards Lindsayston woods. Although it had rained all night, the skies were bright but there were a few angry clouds about. In the woods, which can appear magical, the conditions underfoot were good, not too muddy. 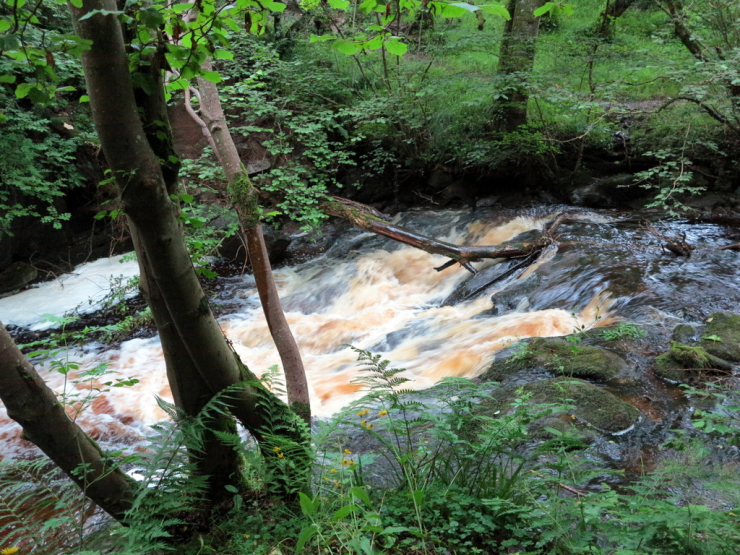 Not surprisingly, the Lindsayston burn was in spate, and there were a few small, but spectacular, waterfalls. Climbing out the woods, we reached the Barr road and headed left down the hill. At Lindsayston Farm, we saw some small pig sheds, one of which had a satellite dish on it. Perhaps the pigs inside were watching ham actors on the TV. Further on by the roadside is a mysterious sandstone memorial which is inscribed “Dr C”. It is not known who Doctor C was but local tradition has it that he was a Doctor from Maybole who was killed at this spot when thrown from his horse, whilst returning from visiting an outlying patient. We took a right turn up towards Whitehill Farm. At the farm we were joined by two dogs, a collie and a labrador. They followed us for quite a while before one of them was turned back by Andy who used his authoritative vet’s voice, while the other one managed to find a way to get through a fence and he followed us all the way to the end of the walk! As the road turned into a track and then into a path, the views over our shoulders opened out to become more and more spectacular. We could see over the village to the sea, Ailsa Craig and Arran. Even the Kintyre peninsula and Ireland were clearly visible. The views down to Girvan and across to Ailsa Craig were stunning and so clear. We were following way markers unlike any I had seen before, part of the Dailly Arts project which also included benches and the footbridge we saw at the end of our walk. They were of metal, set in stones with an arrow in a squashed sickle like shape! At a fence we turned right to pass what is believed to be the site of a chapel founded in the first century by St Machar. It contains parts of an oval shaped earth enclosure within which are two ancient Christian pedestal stones with sockets for holding crosses. As we climbed towards Barony Hill the way markers were again of iron with a leaf type shape at the top. 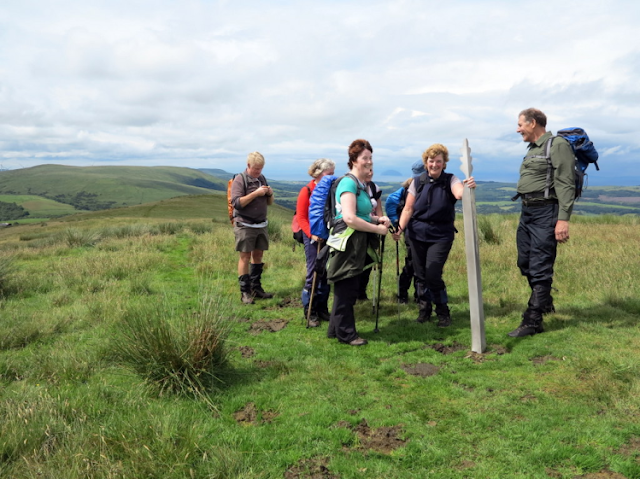 Douglas warned the group, that what we might think was the summit of Barony Hill was NOT! Andrea was not the only one struggling up this section, it did seem to go up for a long way! Crossing the bare hillside, we reached the summit of Barony Hill (1072ft) where one of the many carved oak seats on the walk was situated. The views were even more spectacular, with Maybole, Crosshill, and Ayr bay laid out before us. By this time the collie had left us, but the labrador was to stay with us right to the end of the walk. 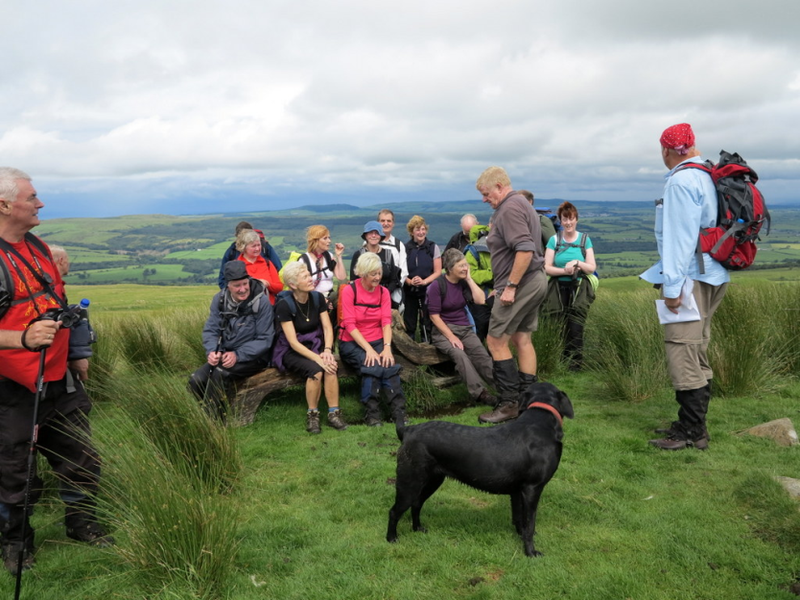 We enjoyed his company; he was better behaved than many of the ramblers. 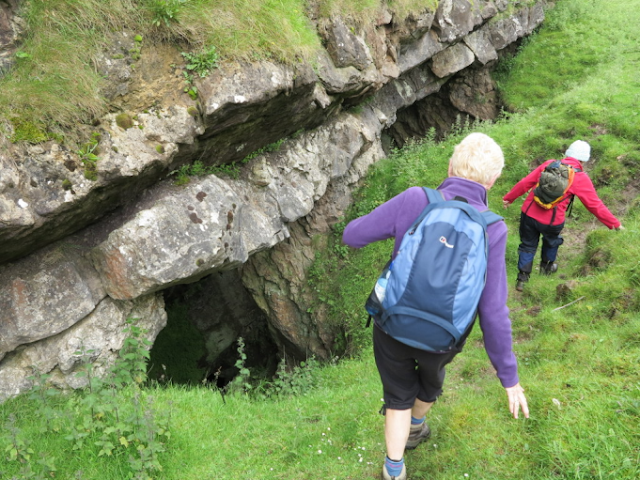 We next headed a few hundred yards towards an old limestone quarry, where lunch was taken. 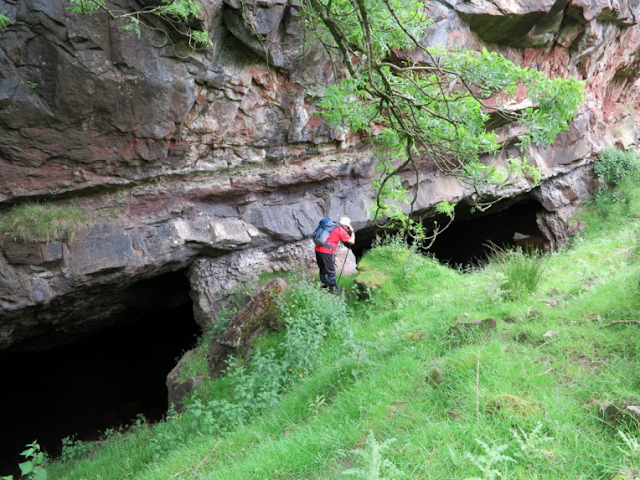 The quarry was fascinating, with some very deep holes and interesting rock formations. Also at the side were two large limekilns. We followed a trackway from these, which led past a ruined cottage connected to the mining operations, and wended its way downhill to a gate and the next part of the walk. When we got close to the quarry, Ken stayed on a higher ridge, joined by Audrey and Margaret while the rest of us went down into a gully where we got some shelter from the slight wind, and we all had our lunch. After lunch some of us explored what we could in safety of the amazing surroundings. There was a myriad of holes, caves formed by the extraction of lime to be transported to a kiln close by for processing – for building or agricultural use maybe. The cavernous openings looked like they could be a pot-holer’s dream! 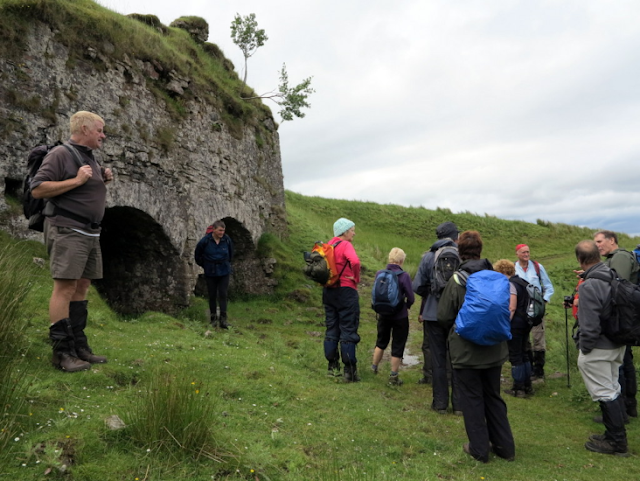 We continued walking through the gully and met up with the others as they reached the Lime Kilns. The route now took us down through an area of deforestation. Soon we took a sharp left up a short but steep hill until we seemed to enter another world, a beautiful glen where glimpses could be had of the countryside below. 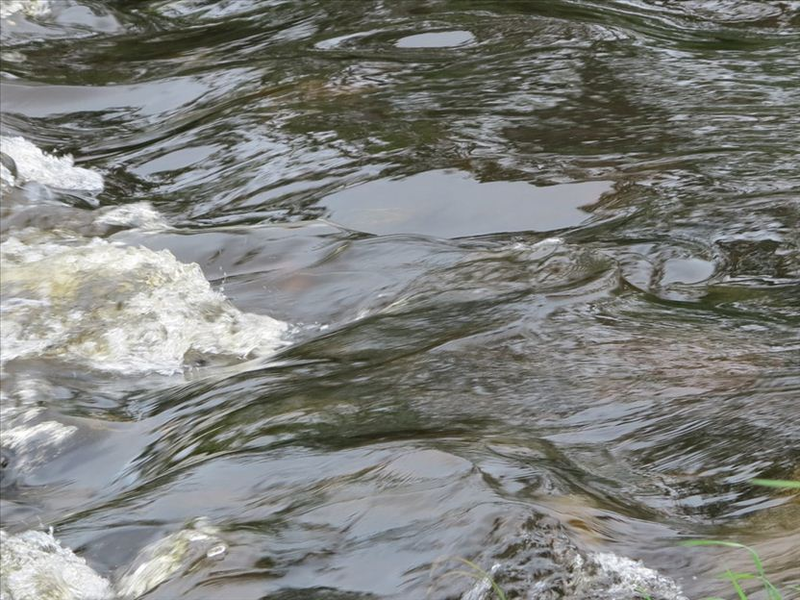 We then passed through Falfarocher Glen, following the burn downstream through marvellous woodland which is the haunt of badger, fox, roe deer, and red squirrel, although only the latter two were spotted on this visit. Walking the bank of the Water of Girvan, we passed the Dalquharran Mansion, which had been conspicuous during much of the walk, sited on high ground on the north side of the river. It was built in 1786 to a design by Robert Adam for a branch of the Kennedy family. Wings were added in 1881 pending a royal visit which never took place. Since the lead was removed from the roof in 1967, it has become more and more ruinous. After re-crossing the river, the ruins of the old Dalquharran Castle were visited. This castle dates from the 16th century and is surrounded by yew trees, some of which are hundreds of years old. This was owned by a Kennedy until 1935. I was overwhelmed by everything that I saw in this ruined building and know that there is more to discover in this wooded area, given more time! 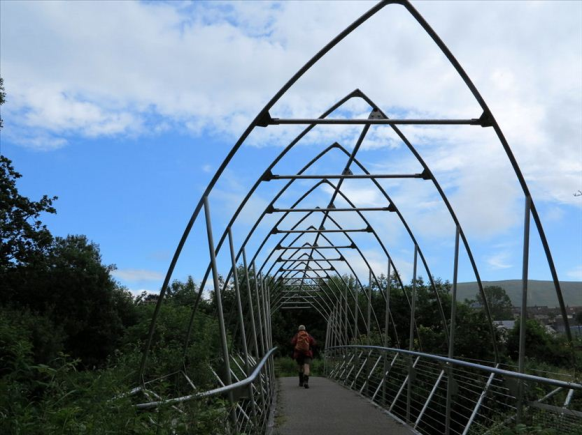 Finally we crossed an artist designed footbridge and walked the short distance back into Dailly. 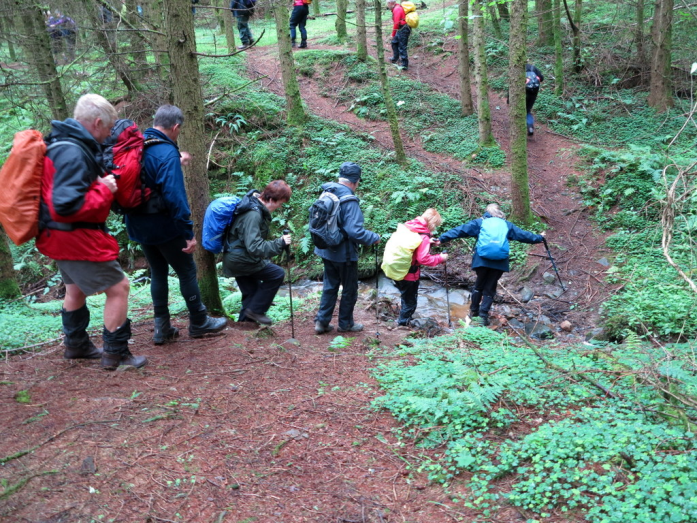 We followed the burn through the wood for a short time before, surprise, surprise, we crossed another bridge! Not any old bridge but an amazing one, with a canopy of steel, which brought us back into Daily. 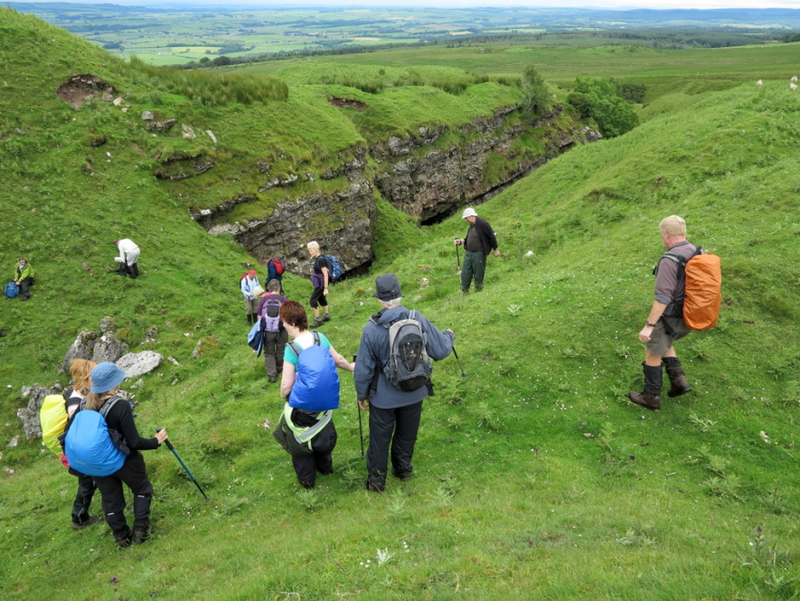 All agreed that it had been an interesting and diverse walk, with something for everyone. It will probably become a regular annual walk for our group. Our new friend the labrador looked very disappointed as we got into the cars and headed off. Most of the group then repaired to the Moon Rings Café where they enjoyed tea and cakes before facing the tortuous drive home. We all piled into the tea room where a long table had been set out for us. We were told to help ourselves to cake and say what we wanted to drink and to settle up later. We all managed to get in but not all on the same table. My scone was good. We were a jolly and noisy crowd in there and it was a great end to a lovely walking day. Women’s final at Wimbledon – Serena Williams won!